Tomb of the Ferryman was chosen to be featured in an IGN co-op preview video in July, five months before release. ﻿﻿ This is the only area in Tomb of the Ferryman to feature the Time Bomb. The mechanic was limited to one appearance in this tomb, so I had to make the most of it and fight for this design to make the cut. I wanted to showcase the water current mechanic, one of the tomb's thematic focuses, to give players a novel way of accessing a Time Bomb to destroy an exit door, breathing new life and interest into a familiar activity. This simple setup was designed to introduce the idea of key gameplay objects at the mercy of water currents. This basic idea became the inspiration behind the Waterfall of Sobek Challenge Tomb, an escalated manifestation of this design. This setup, required me to create new "flipper" or "catapult" object that uses the players' Staff of Osiris mechanic to rotate it, launching any physics objects that may be resting upon it into the air. I also created a modified version of the rising square column that operates horizontally rather than vertically and acts as a pinball plunger of sorts. My design also inspired designers to revisit an area in Tomb of the Timekeeper and implement a new Time Bomb set up that utilizes a Staff of Osiris-activated horizontal square column. This area also features a unique combat challenge, "Use the Trap Platforms to Dunk an Enemy", which rewards a Max Ammo Upgrade. 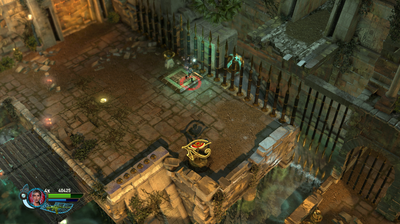 Players can kite minions of Sobek onto the wooden trap platforms and shoot the switch that controls them to dunk the minions into the water. The challenges were a fun opportunity to hide some gameplay beats without explicit instruction. Some of the player-facing challenge language employed made completing some challenges feel like solving a riddle. 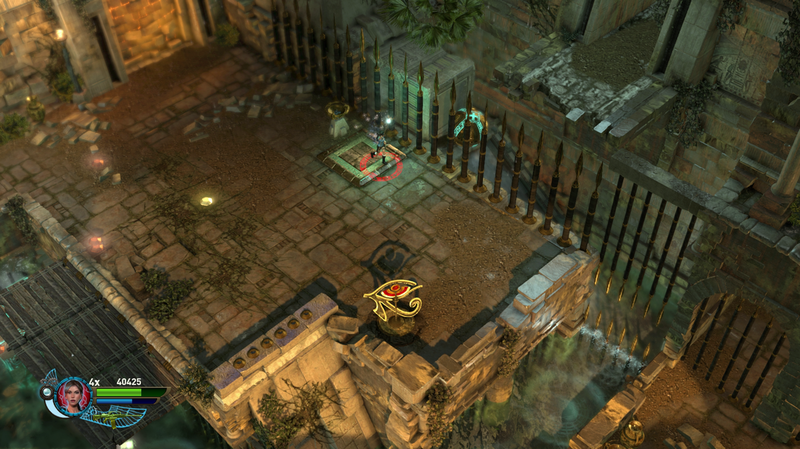 I built this area to support sustained combat encounter. 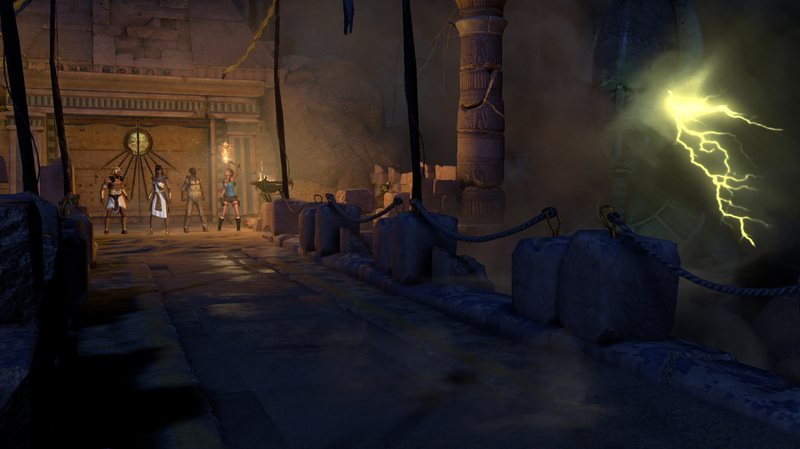 Safe players will stick to land and defeat the minions of Sobek before venturing into the water and inhibiting their mobility during combat in pursuit for goodies. 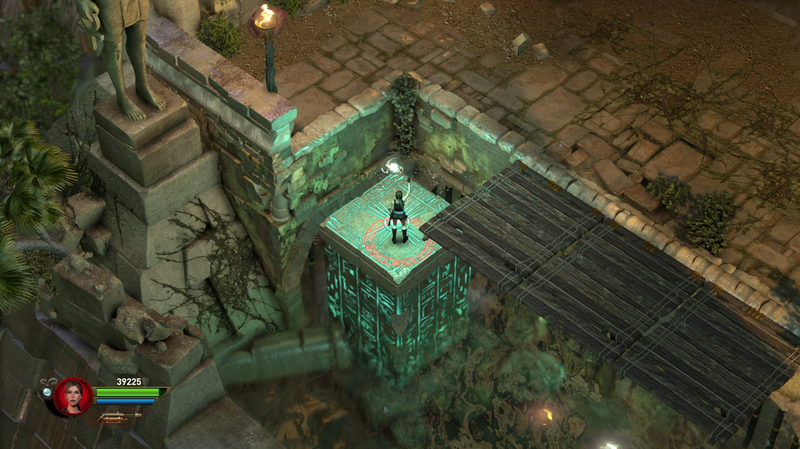 Bolder players who cannot resist the lure of shiny gems might dive in before navigating back to the stairs or the Staff of Osiris activated rising column to return to land. They may also decide to perch up on the destructible columns, where they have a clear shot at the enemy but very little room for dodging projectiles. 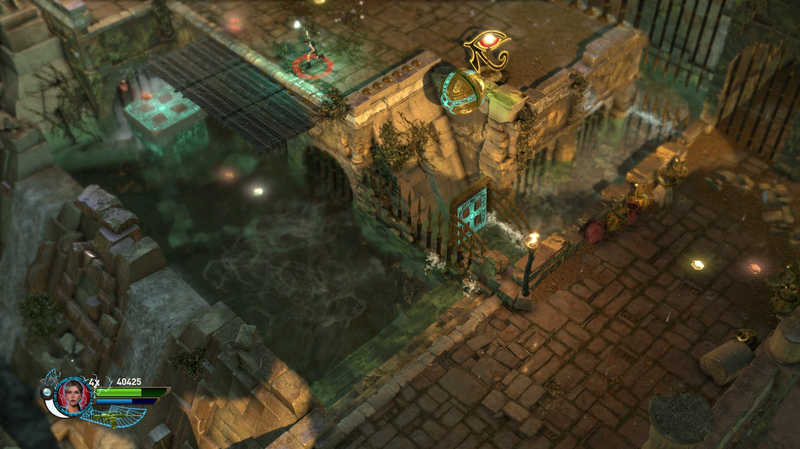 Explorers who take the side path to the end of the aqueduct and collect the Max Ammo Upgrade must fight their way back through an ambush of Sobek minions on the aqueduct or they can choose to dive back into the water for a longer but safer path towards the area's exit. 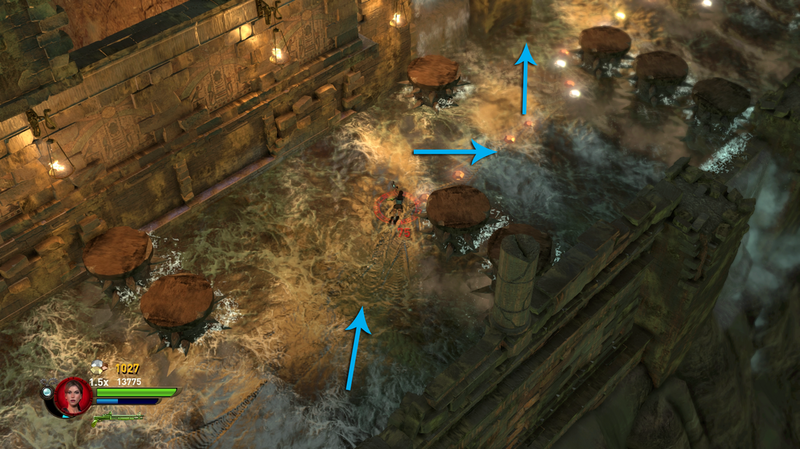 The very first room in Tomb of the Ferryman introduces the water current mechanic to players, which we wanted to feature fairly heavily throughout the tomb. I devised a setup with a seemingly unreachable shootable submerged in a water current behind a gate. Drawing a little inspiration from the implicit design employed by so many of the classics I grew up with, I set up a chain of floating gems to spawn in the water current, which periodically carried them under the gate and past the shootable switch. These gems are in fact only spawned once and when they float off screen, they teleport to their initial starting position, giving players a chance to collect them all while continuing to demonstrate the behavior of objects in that body of water and avoiding any gem farming exploits. Players who deploy a remote bomb in this body of water discover that it too is carried by the current and under the gate. They can then detonate it to proceed, ensuring that the current mechanic is conveyed. 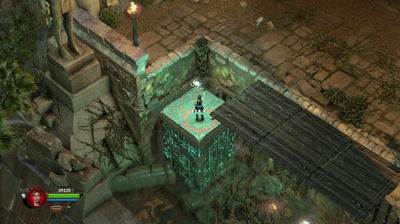 They can also leave another bomb behind to detonate once they proceed past the gate for the tomb's first Red Skull. 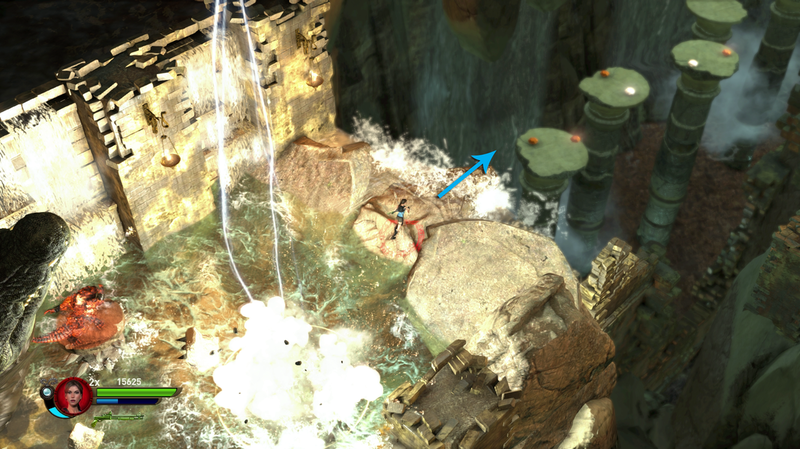 This harzardous river tests players' platforming skills as they traverse across columns above a violent current that drives spike ball hazards down a waterfall. Bold players can take a chance on the Max Health Upgrade that lies of the main path. Unfortunate players who fall into the river have a strong current to swim against and spike ball hazards to avoid. However, they do have the opportunity to return to the high path by destroying the smaller columns with a remote bomb and using them to jump back onto one of larger square columns. 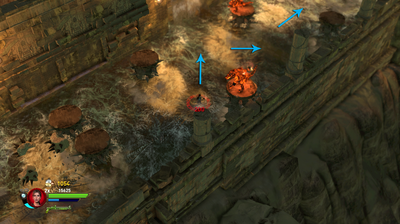 Players who traverse across this section without once falling into the water will complete the "Cross the Spike Ball River without Touching the Water" challenge which rewards the Solar Copper Ring of Strength. Ammit, the devourer of souls is a demon of Ancient Egyptian religion featured in Lara Croft and the Temple of Osiris. This part lion, hippopotamus, and crocodile makes three major appearances in the game and violently pursues players, destroying everything in her path. She makes her second major appearance in Tomb of the Ferryman, where I was tasked with making the run-out sequence capitalize on the water current mechanic to further its distinction from the game's other Ammit appearances. I had ownership of the spinning spike hazard pool. 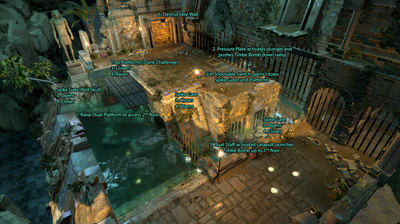 The pool's strong currently constantly thrusts players forward as Ammit pursues them. Players must leverage their movement to carefully but quickly react to the oncoming spike hazards and think ahead by choosing directions that set them up for success further down the line. The floating gems make another appearance here and incentivize players to swim quickly, sometimes hinting at safer routes and occasionally leading players into dangerous scenarios for risk and reward. If players are quick, they can catch up to and collect all these gems. 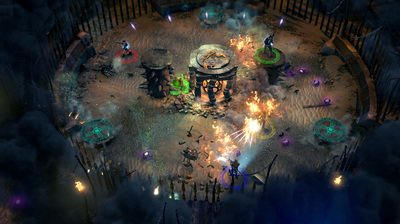 Towards the end, minions of Sobek mounted on the spinning spike hazards lob projectiles at players for an added hazard as Sobek summons lightning strikes that decimate the surrounding area. It was important that this sequence was not only mechanically intense but also aesthetically gripping. I was responsible for both the gameplay and the performance implementation here. 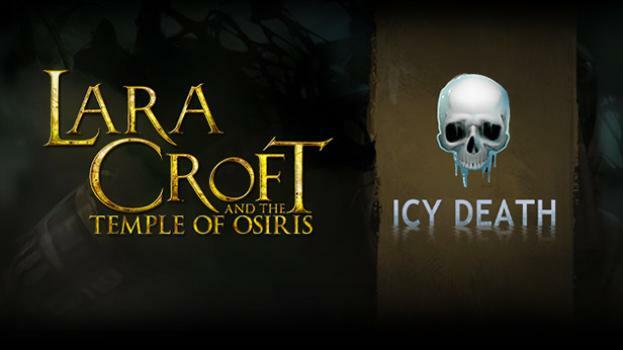 Icy Death Pack is the first of two DLC packages that add a tomb to the main game experience. 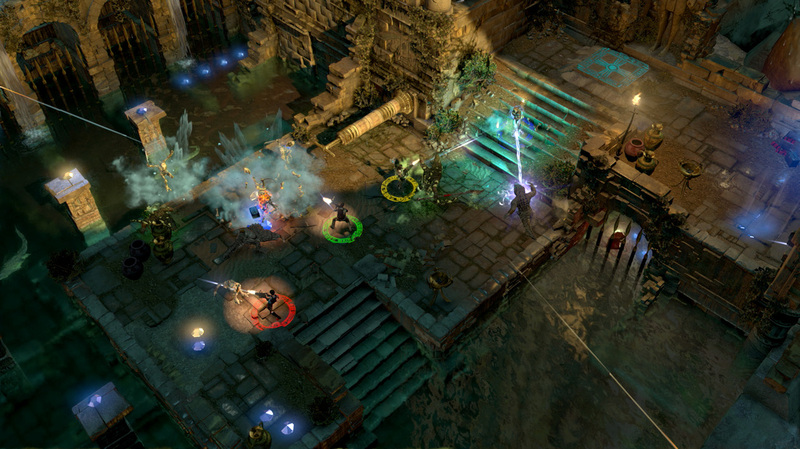 It features Tomb of Hoarfrost, a frigid domain of devious puzzles and deadly enemy hordes. 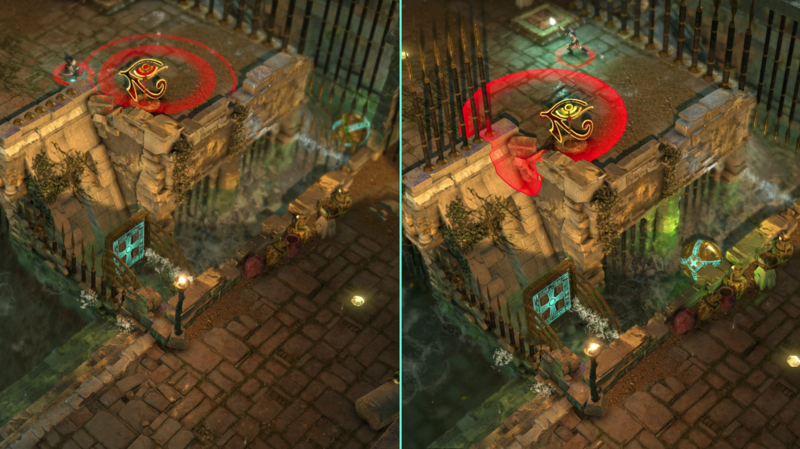 I designed and built five of the eight rooms in Tomb of Hoarfrost during Lara Croft and the Temple of Osiris's development cycle. 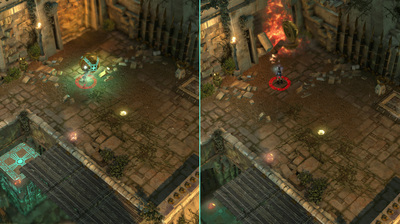 The tomb features freeze vent hazards and new enemies. I also scripted many unique patterns for collections of freeze vent hazard objects. Some of my favorite moments are highlighted below. 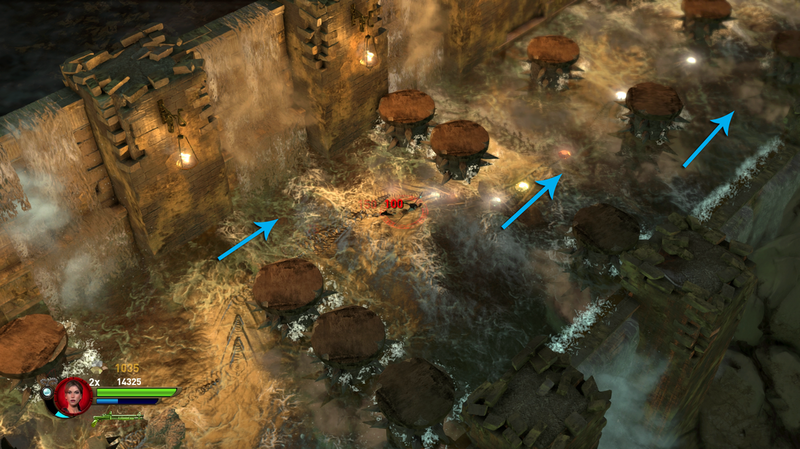 This run-out exit room features a crumbling bridge and falling ice stalactite hazards that decimate the playspace and force players to react quickly and sometimes change course to guarantee safety. I carefully laid out tile pieces that crumble away a short time after players step on them, using dimensions of 1x1, 1x2, and 2x2. I also carefully laid out the ice stalactite hazards to create a pace that was interesting and intense, but still surmountable. This design also features a dynamic layout I built to scale up for three or more players. I also implemented the challenge, "Grab all of the gems on the collapsing bridge", which rewards players with the Frozen Band of Set's Favor ring. I laid out gems here to make this challenge one of the really touch ones, as it often requires players to deviate from the safest and most predictable route. It allows little room for error, but is one of the more rewarding challenges in the game to accomplish. 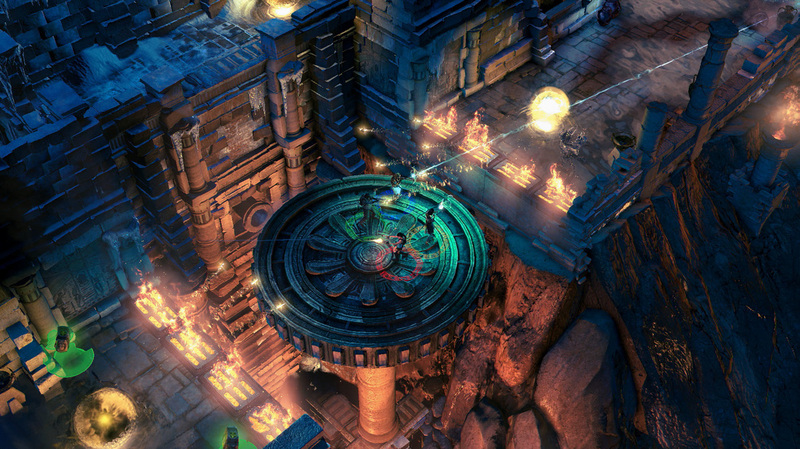 This design was born out of a goal to leverage a freeze vent hazard pattern in a novel traversal scenario. 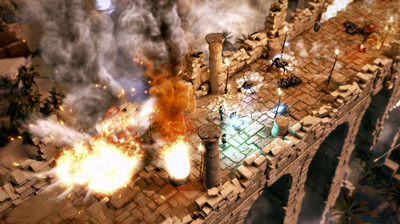 It requires players to ledge shimmy along wall-mounted hazards and to time their approach so they can reach safety before the vents catch up to them. The hazard pattern moves slightly faster than the players' ledge shimmy movement. However, the gap in the pattern provides just enough time for players to succeed. The slower movement speed of the ledge shimmy adds to the suspense of the setup. 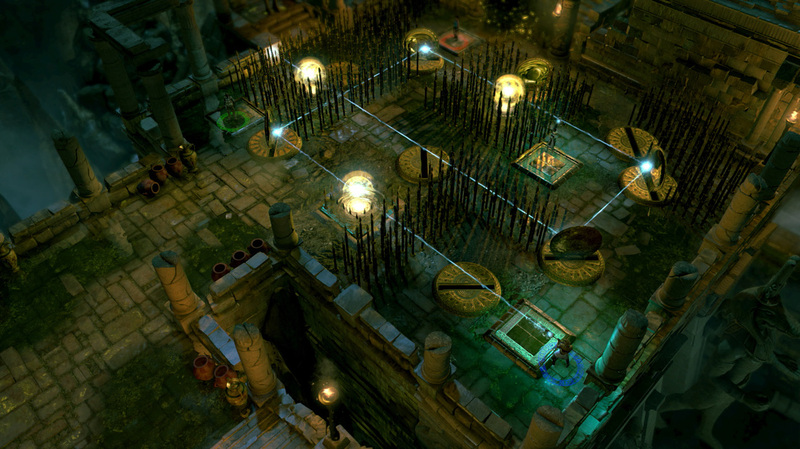 The design also, utilizes and recycles a small space with a very low footprint in an interesting way that allows players to backtrack for a Max Health Upgrade while fighting off enemy hordes after completing the room's main objective. This combat setup requires players to carefully move the sun ball into its cage while snuffing and avoiding the floor's freeze vent hazards and surviving an enemy onslaught. I built large custom modules of vent hazards which randomly select vents to fire at different designer-specified rates and volumes. 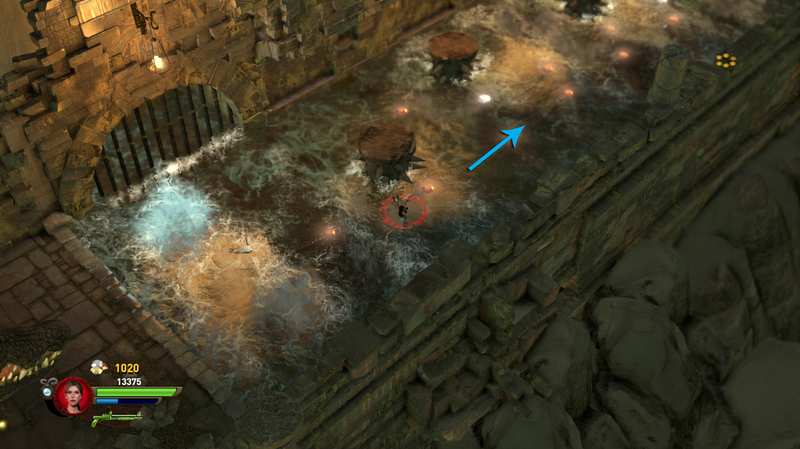 The room rewards players who grapple down to a wall-mounted pressure plate with access to the Icy Death weapon. Players can also use the sun ball to snuff freeze vent hazards and leap off of for access to an otherwise out of reach Red Skull that rests above the main playspace. 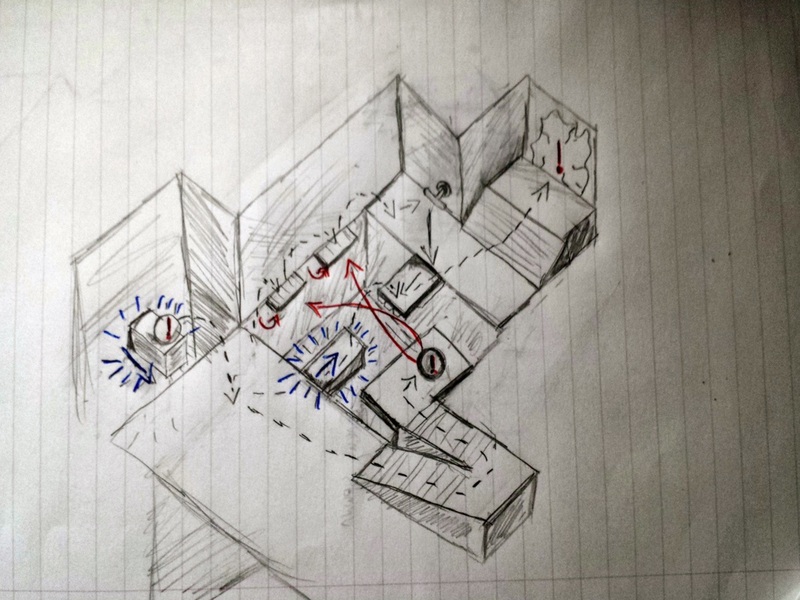 Here is an example of a preparation sketch for a design I worked on while prototyping rooms daily. This design is what first inspired me to build the horizontal Staff of Osiris rising columns (noted in blue ink) that would later be used in other tombs. Players must use it to catch a falling time bomb, and then bomb it over a small gap into the main playspace (noted on left with red exclamation point and blue arrow. The time bomb is necessary to activate a pressure plate that raises some trap panels that allow players to traverse over a large perilous gap (noted on right with red exclamation point and arrows). 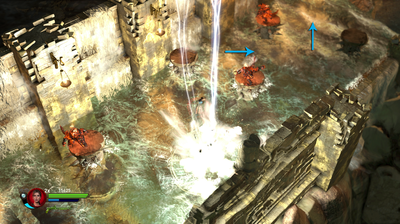 Once they reach the other side, they discover that the path forward is blocked by a destructible time bomb wall. However, they can use a pull switch here to open a draw bridge that extends halfway across the gap (noted in black arrows). With this bridge extended, players can now collect a second time bomb, roll it out to another Staff of Osiris activated horizontal rising column (noted in blue ink), bomb the time bomb across the gap onto the draw bridge and roll it forward to destroy the exit wall and proceed. My goal with this design was to combine several mechanics different mechanics in interesting ways players may have not previously seen. Necessitating use of the Staff of Osiris just to catch a time bomb, and using the same time bomb mechanic as a double for a time sensitive switch and for wall destruction to proceed were new ideas. This design also provided interesting retraversal and recycling of space.